I'm having a productive week, not so much with the crocheting but the spare room decorating has got off to a good start, all the horrible purple paper has been stripped off and I am left with a rather depressing beigey brown colour. 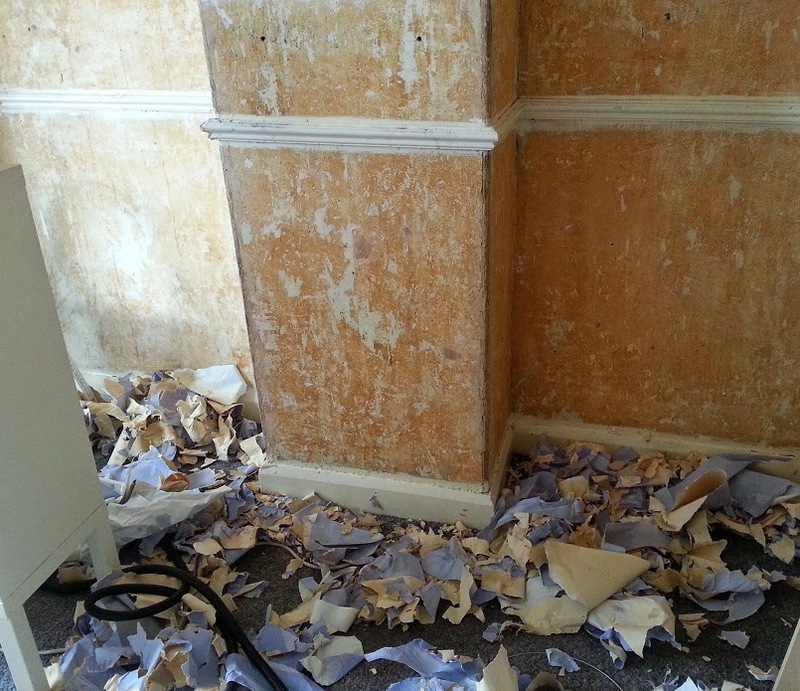 Just a load more preperation to do and I can get the walls papered and painted. 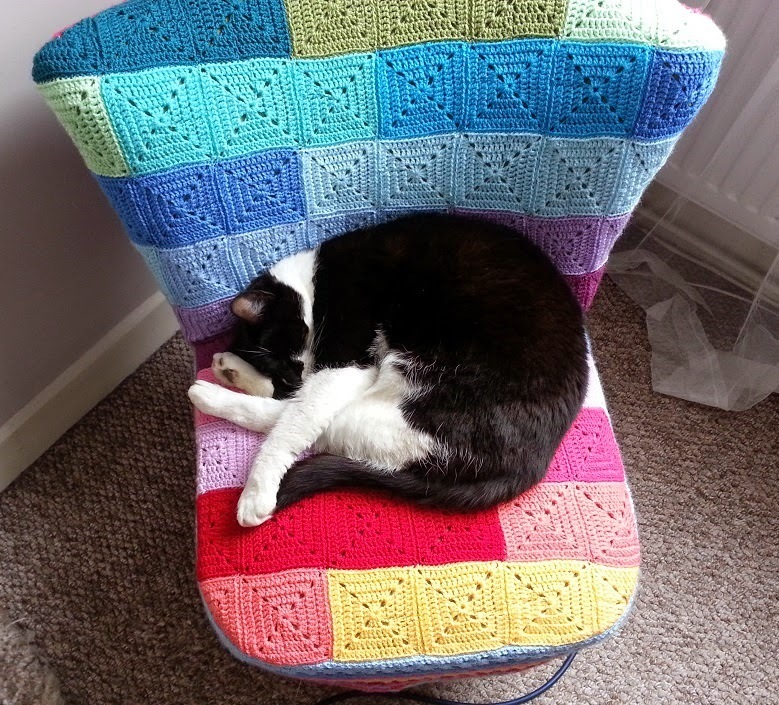 I am really quite excited to get it done, I have a completely free rein on how to decorate it and I plan to give it lots and lots of wooly additions to make it bright and cheerful. Talking of bright and cheerful, I stumbled upon a very sweet little picture of a beach hut by my extremely talented friend Caroline. 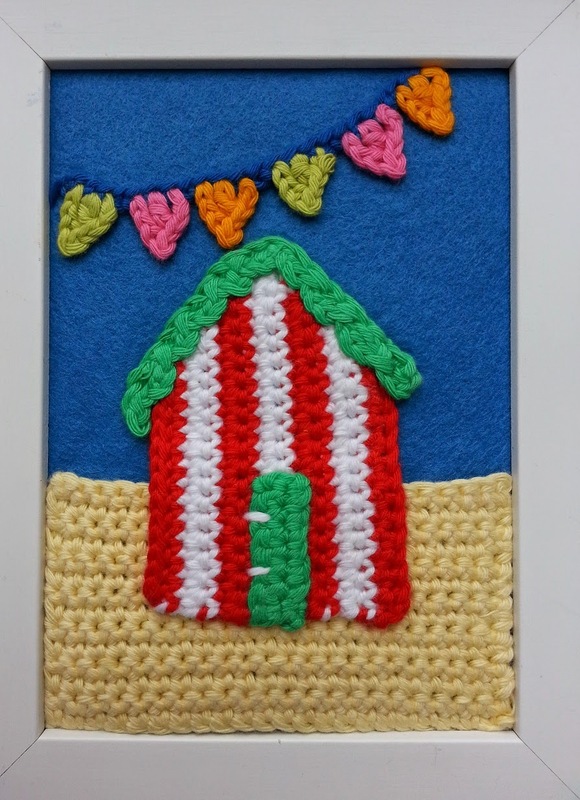 I have had the idea of making a 3D crocheted beach hut/seaside scene for a few months now and been mulling it over as a possible future make. As I was clearing the spare room for decorating I found a few long forgotten little picture frames so decided to have a go at a two dimensional seaside picture instead, very much inspired by Caroline's beach hut. 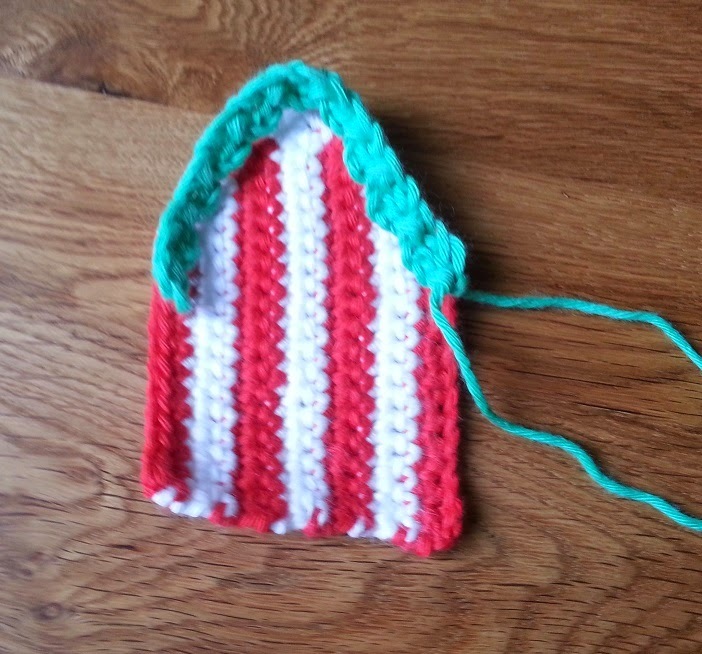 I grabbed my bag of Rico Creative Cotton and started by trying to get the shape of a beach hut which was fairly simple to do. 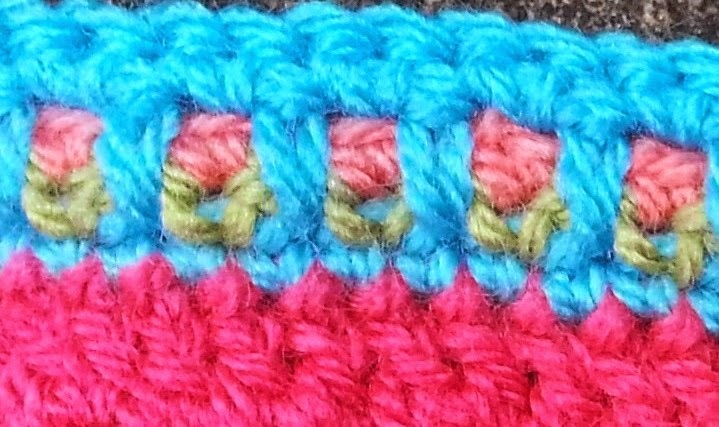 Just a few rows of Double Crochet, with extra stitches at one end and then fewer stitches on the other side to get the pointy gable bit. The frame I wanted to use was fairly small and the yarn is an aran weight, so I just wouldn't have space to make anything too intricate. I settled on keeping it simple with just a beach hut and some dinky little bunting accross the top to add a bit of interest. 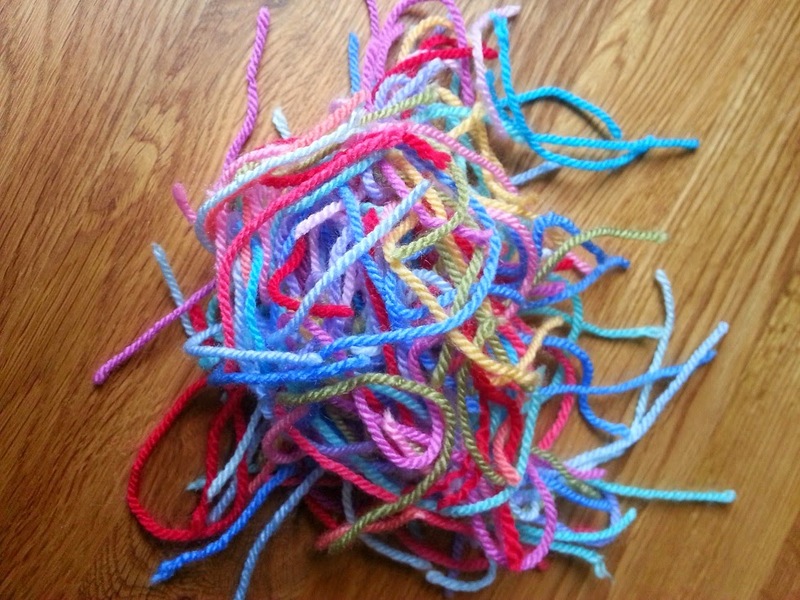 I wanted to crochet the whole backing piece, starting in yellow for the sand and then carrying on in blue for the sky. It was just too thick for the frame so I used a piece of acrylic felt and bonderwebbed everything to it so that it fit snuggly in the frame. Isn't it sweet? I love how cheery it is. It may well be the closest I get to the seaside for the rest of the year! I have a few more frames like this and would like to fill them with other scenes similar to this one. Another find while I was clearing out the spare room was a bag of colourful 4 ply merino I bought at last year's Yarndale. It would be so much better to use for this sort of thing than the bulky Rico, and I seem to have quite a lot of it. I think I had intended to make some sort of cushion with it originally but as often happens with cushions, I lost interest. I got this far before moving onto something else. 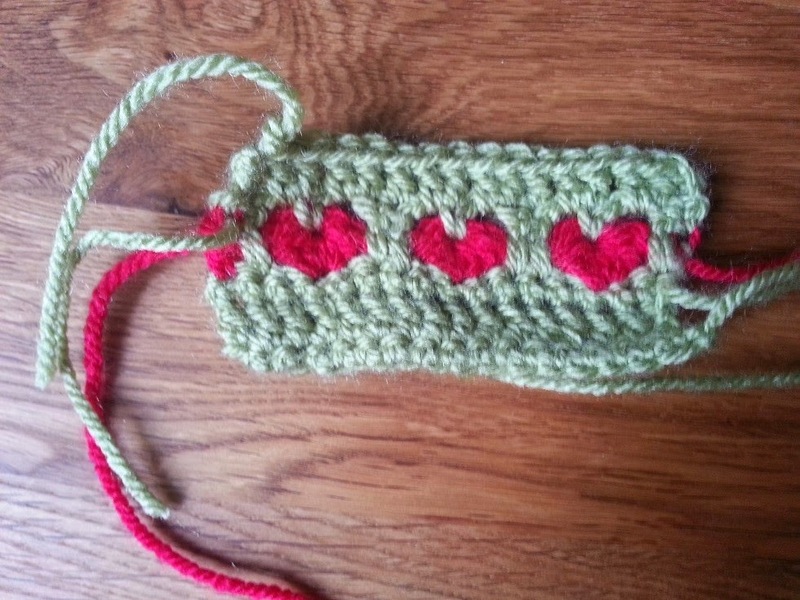 It's been a few days since I started having a go with broomstick crochet and I think I am getting there with it. 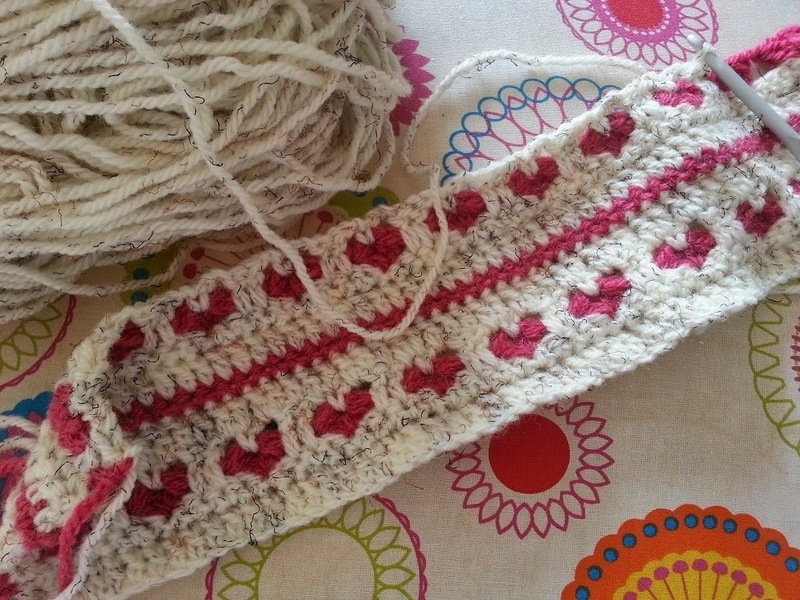 I am really pleased with how my new scarf is coming along and it should be nearly finished. Over the weekend I have been thinking that it is a shame that I didn't choose something a bit more adventurous to make. 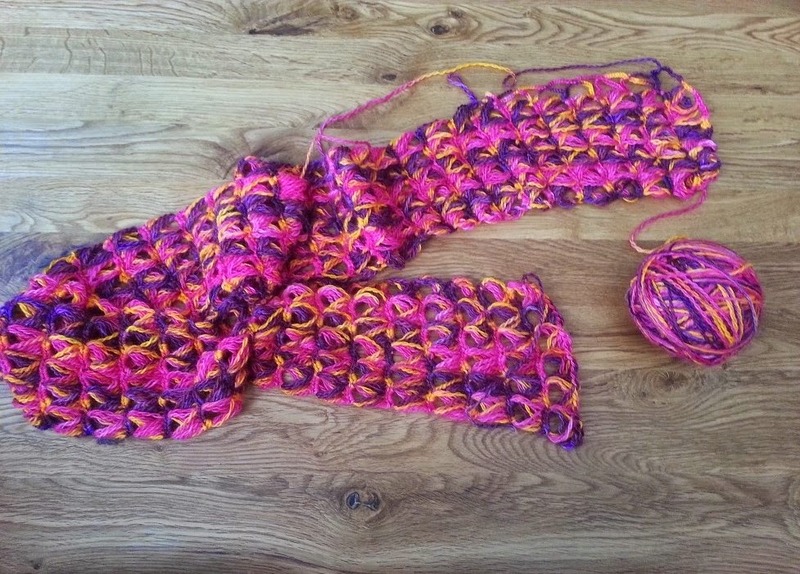 I started simple, as broomstick is a new thing for me, but I soon got the hang of it and a scarf seems a bit too basic really and I wonder if it will ever get worn. 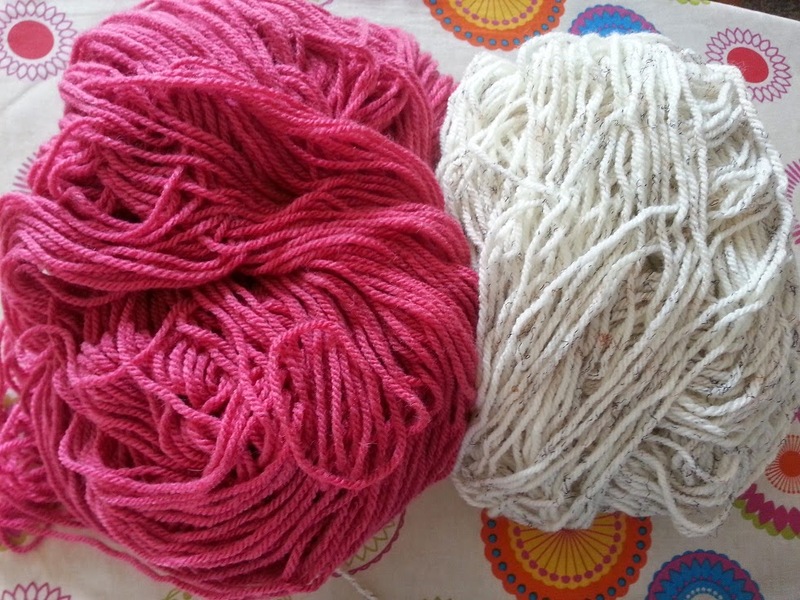 I also have quite a bit of this wool left but as it is hand-dyed (and therefore unique) if I do make something else with it I will have to make sure it is just enough to use up this wool and no more - I can't go out and get another skein if I run out half way through. So my mind started wondering to what I could do with this scarf that could use up more of the wool and make the scarf more usable. Even in very cold weather I don't really like things around my neck and this scarf isn't going to give much protection from the cold as it is so lacy and loopy. 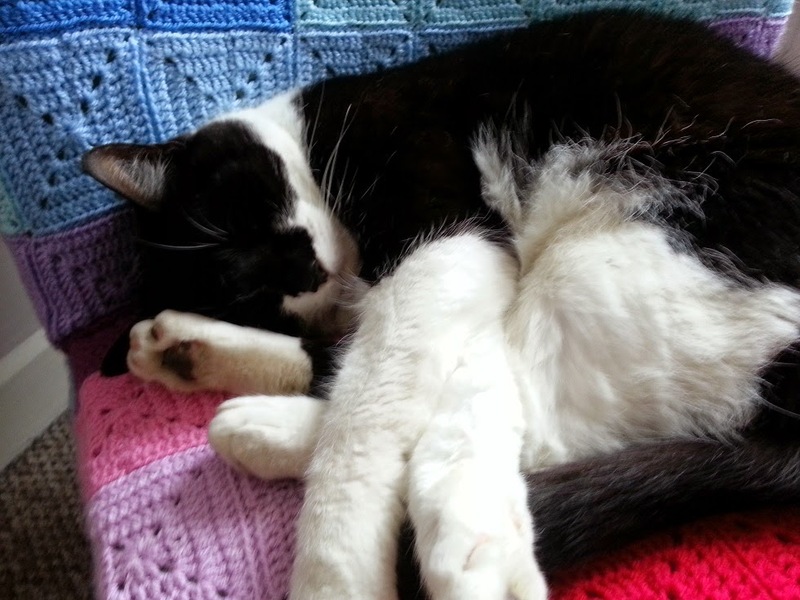 I would really like to make a shawl or wrap with it but I haven't got enough left to make anything from scratch. I considered for a minute or two unpicking it all and starting again but that does seem like a waste. I had a play with it and a doodle in my little sketch book and think I have come up with a way of adapting what I have already made. I did a quick mock up in some scrap acrylic yarn and played around trying to find a good way of extending the scarf and I think I have worked out how to do it. I've added a row of chains to one side so I have a base to carry on with. What I don't want is for it to look like I was making a scarf and then changed my mind half way through, although that is exactly what I have done! If it does look awful I can soon unpick this extra bit and turn it back into a scarf, I suppose then I could make a matching hat or mittens to go with it with the spare wool but I have high hopes that this will work. Thinking of shawls and wraps has got me feeling a bit guilty over my long neglected flower shawl and while I was pondering the possibillites for this scarf yesterday I dragged it out and made a couple more flowers. 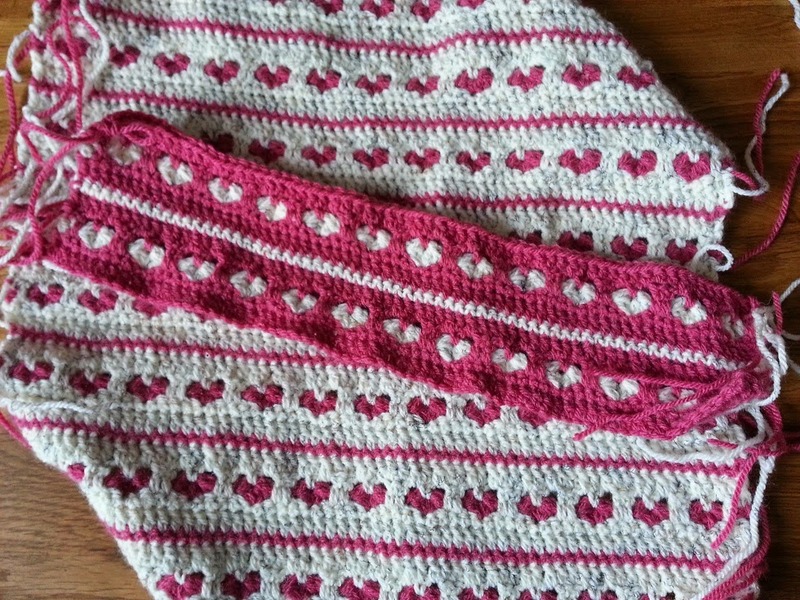 I really do love it and I am left wondering why it is taking me so long to do, but then I am very easily sidetracked! 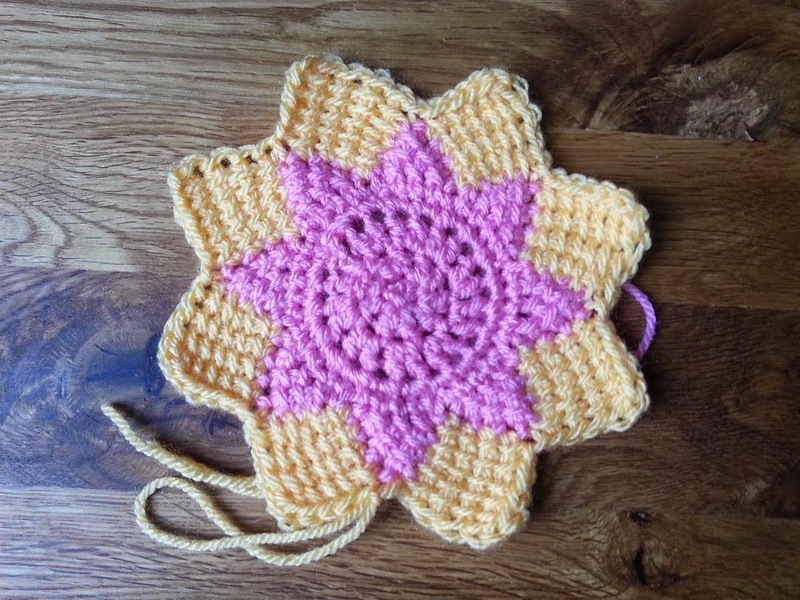 The sun has been belting down for days on end meaning little sleep and little energy, that's OK though, it's not that taxing crocheting all day! My cushioneering all done for a while I have been messing about with bits and pieces all week trying to decide on what to make next. 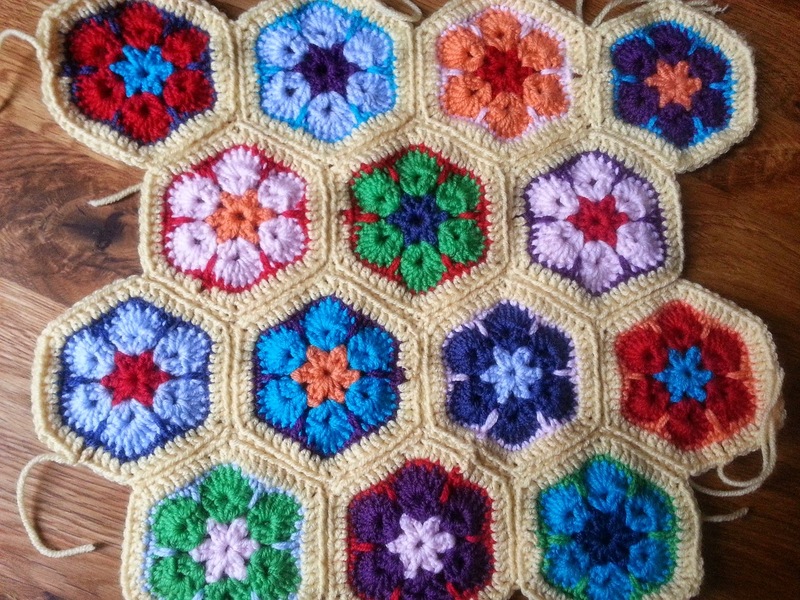 It is definitely too hot for blanket making so my current blanket WIP has been put away for cooler times. I fancied doing something small, lightweight and fun! 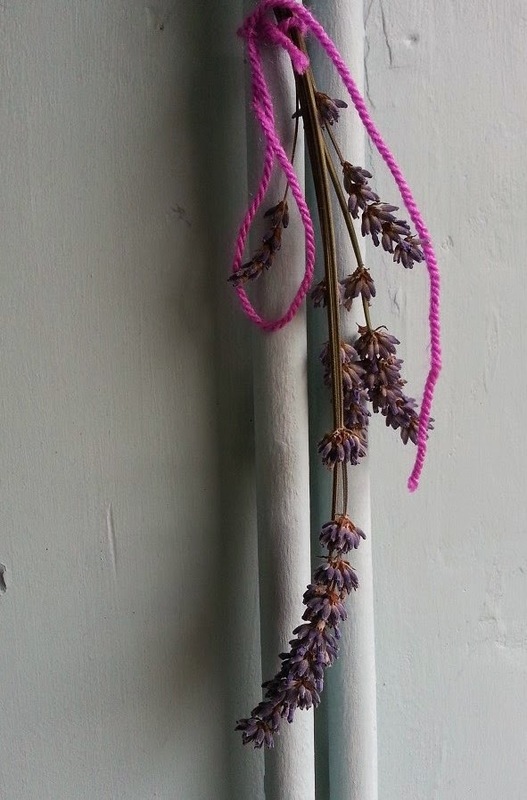 A few years ago, just before I got totally hooked (excuse the pun) on crocheting I had a half-hearted attempt at Broomstick crochet, or Broomstick lace. 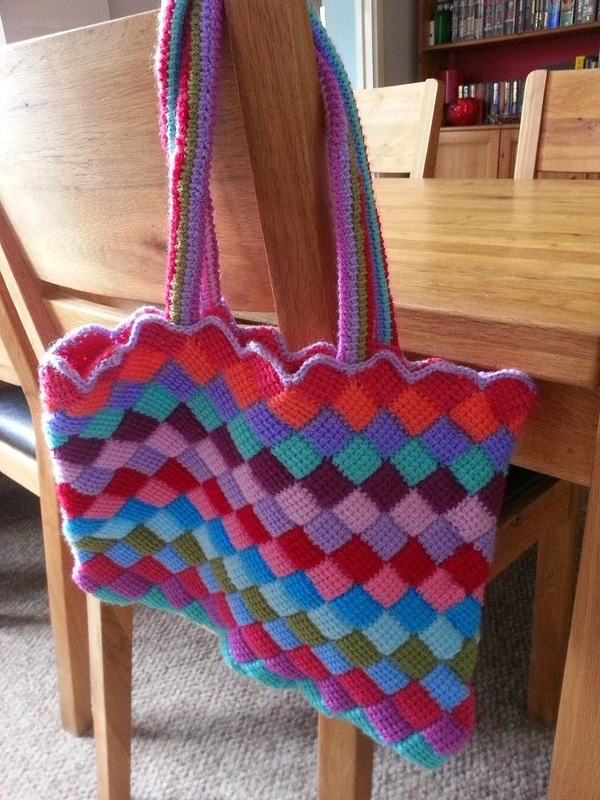 I really wanted to have another go at it, I love learning new stitches and ways of crocheting so that would definitely fit my 'fun' criterion. If you are not familiar with it, it is made with a normal crochet hook and a large knitting needle or piece of dowel, historically I expect a broomstick was used, hence the name. 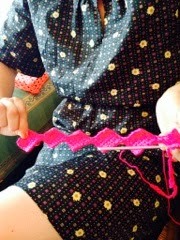 I am not a knitter, I can do the basics and that's about it. 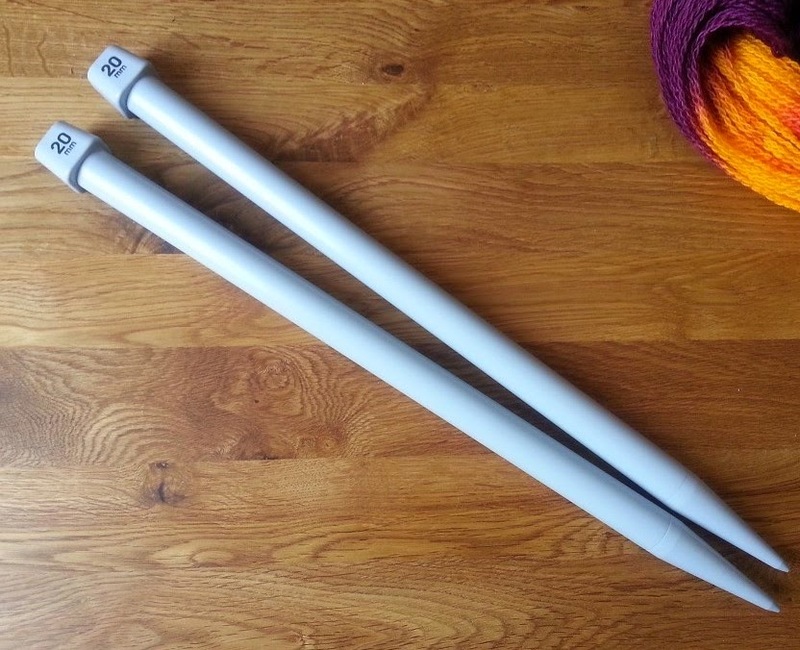 I have no idea how anyone could knit with these huge unwieldy things, my hat off to all the amazing knitters I know who would be able to manage with them no problem. Ah so pretty! 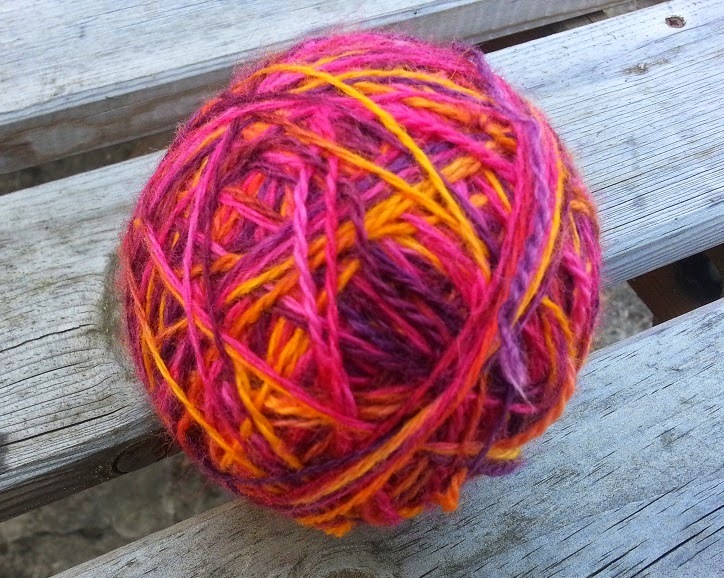 No good like that though, so I dusted off my yarn winder and set to making it into a ball. My winder lasted all of two minutes before it broke - well it's not exactly broken, my husband has since fixed it but this morning, with wool draped all over me in an effort to not tangle it, fixing gears and winders was a bit beyond me. I hand wound until I had to stop due to the huge knotty mess that it had become. 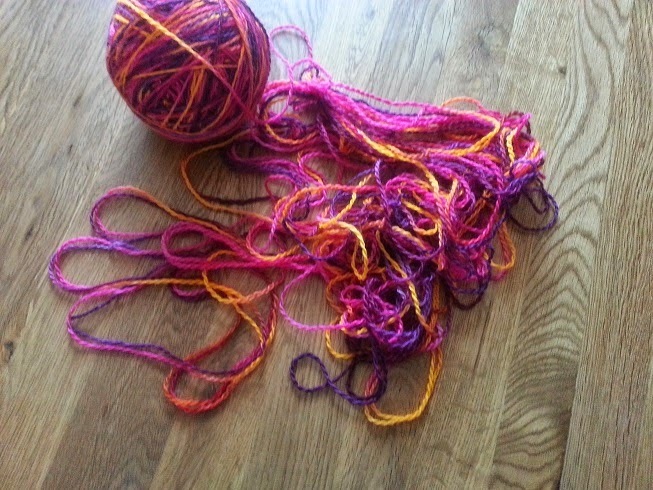 It took so long to untangle, at least 3 hours I think in total but I managed not to throw a hissy fit, kept calm and persevered. Hurrah! I got there in the end. I have a few issues to work out but I am getting the hang of it as I go. 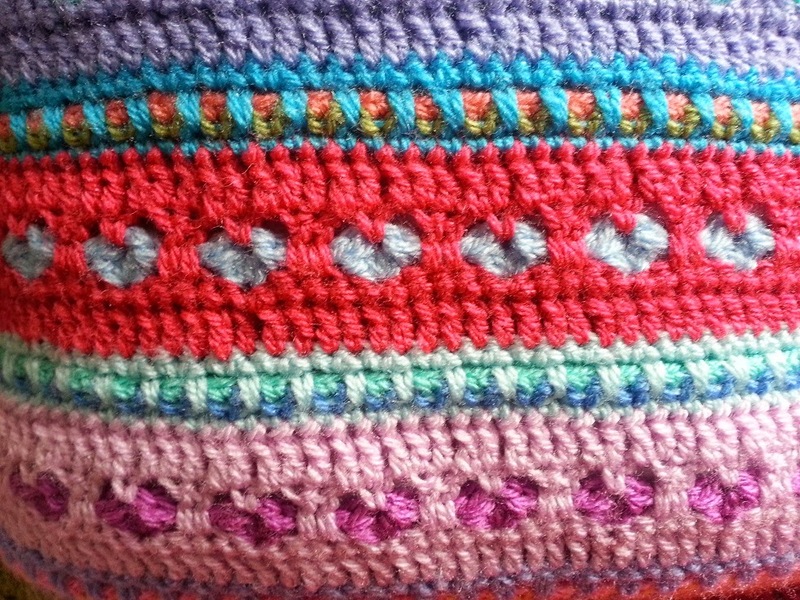 Tension is a bit of an issue, I am having to adopt my Tunisian tension method (holding the yarn differently to make it looser) and it seems to be working, it is getting neater as I go. I really like the lacy, loopy effect too, and OK, I'm not that quick at it yet but that doesn't really matter, it's not like I desperately need a scarf right now! Yesterday was my first time teaching a workshop and I am pleased to say it went very well indeed! The workshop was in the wool shop where I go to a weekly Knit and Natter group. It's a lovely little shop, full of pretty yarn, buttons, farbic, beads and things. if you are ever in the Castleford area do pop in to SewSusieBloom! I had been a bit nervous about the workshop, it being my first time and I was to be teaching Tunisian Entrelac of all things! When I got there the lovely shop owner Sue, had laid out all the yarn for the group to work with and it was looking extremely pretty. 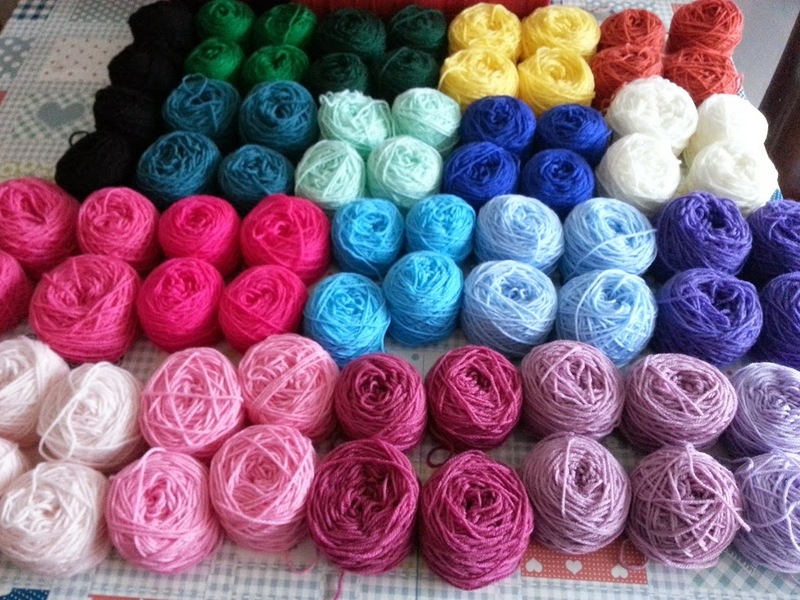 I do love to see yarn laid out like this, you might remember my own little yarn ritual that I do when I get new stuff, I lay it out just like this. I find it so inspirational and as soon as I looked at it I started to get new ideas of things to make - I am easily sidetracked! If I want a cheap acrylic yarn I usually use Stylecraft special DK, mainly because that's what I bought first so I can just top it up with a few balls every now and then. 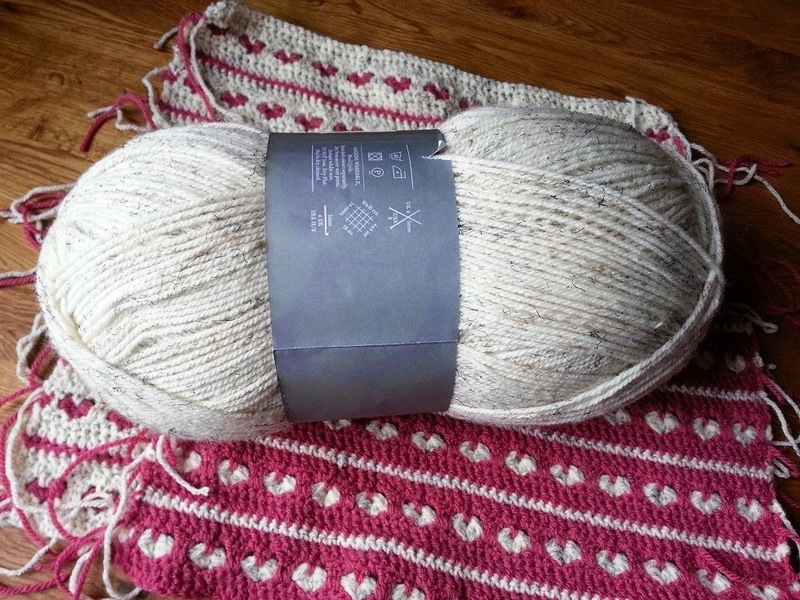 This is Hayfield Bonus DK and I found it very nice to work with. 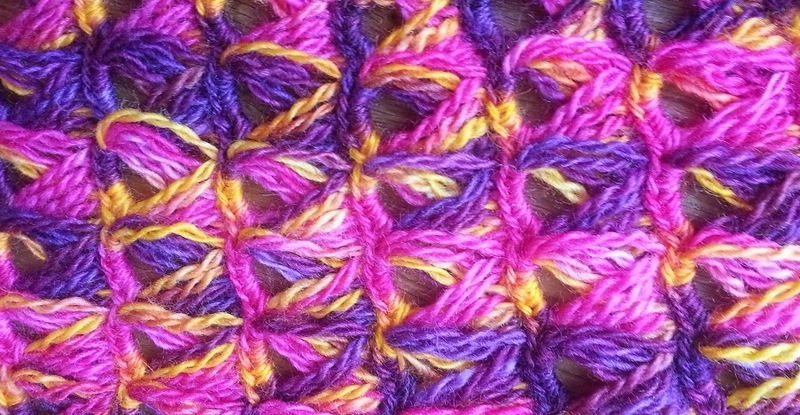 It is a touch thicker than Stylecraft and I was surprised by how many colours it comes in. 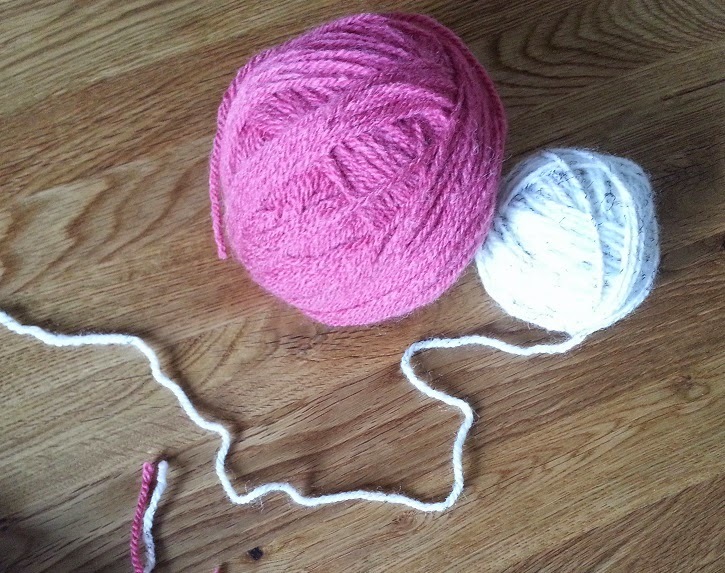 Thinking about it, I am pretty sure I used this yarn to make my circle-square cushion. So I had all my notes and patterns printed, which was an achievement in itself after spending most of Friday cursing the printer and messing about with new cartridges, I started to feel like I was back at work doing 'admin' with my dining table (usually covered in wooly things) covered in paperwork to collate. The ladies arrived around 10 O'clock and we soon got down to business. With plenty of tea, coffee and cake to fuel the day the time just flew by, with lots of very good hooky and laughter. 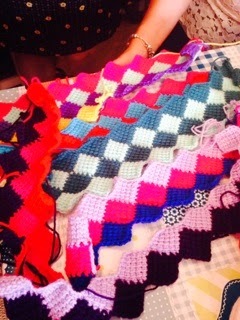 The end result being that everyone managed to do some wonderful Entrelac work, I am so proud of how well they all did! I really enjoyed the day and I'm looking forward to the next workshop! 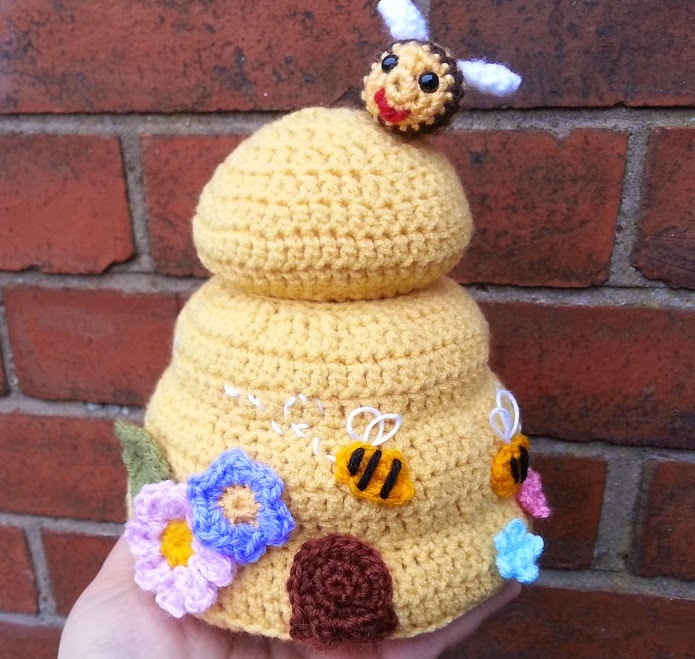 The busy crochet week has continued, luckily free from any more wildlife for now. 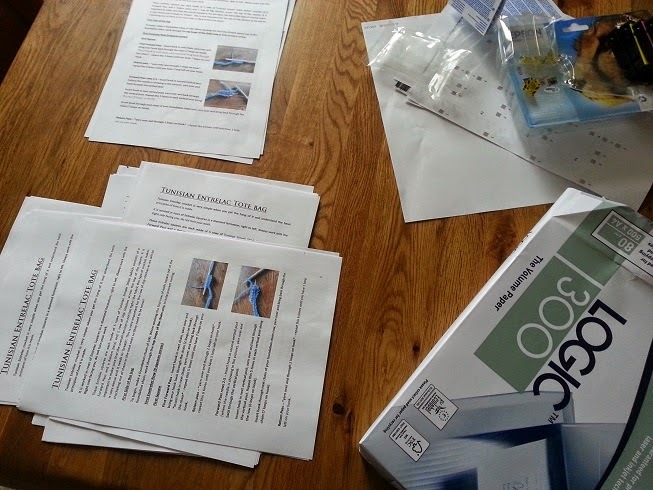 I am trying to get ready for the weekend as I am teaching my first workshop on Saturday! I could have picked something easy but where is the fun in that? 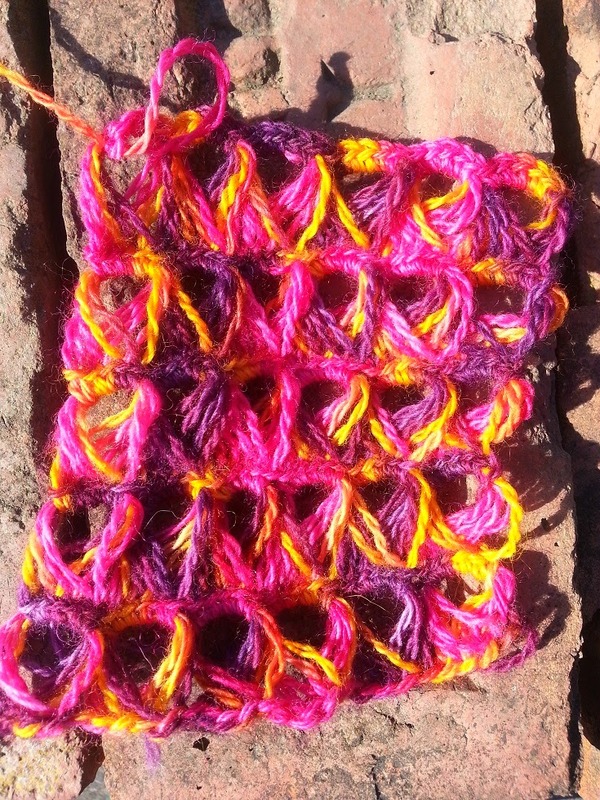 So I am going to be doing Tunisan Entrelac. 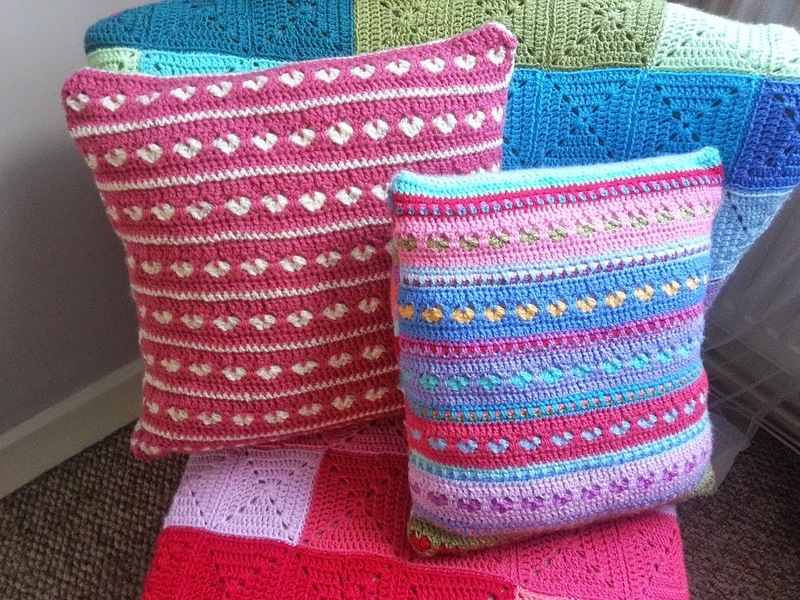 This week I have been busy refining the patterns and getting them all written up nicely. I've been carrying my note book everywhere as I keep being hit by things I need to tell the group, how-to's and such. I do hope I don't make a complete hash of it! As I have been thinking of all things Tunisian, I have started on a round thing. I am still working out the kinks, literally, but it's getting there. I hope to get it sorted out today so that is something else I can give the lovely ladies who will be my first guinea pigs on Saturday. If I can't get this sorted by the weekend I do have a fall back pattern and this one may have to come straight on here for your hooky pleasure! I have also managed to buy a ball of the flecky cream that I needed to finish my hearts cushion, you know, the cushion I started off as a way to use up scraps. So it is a bit annoying that the only size ball this comes in is 400g! 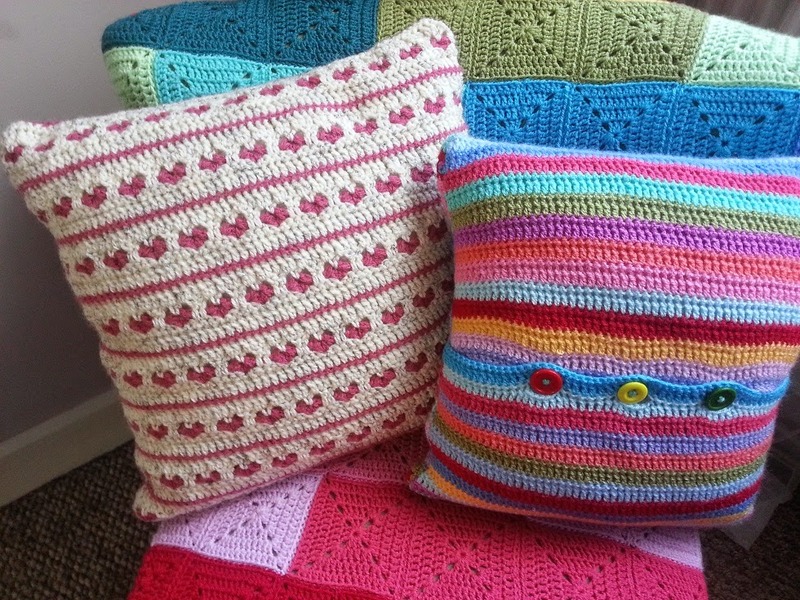 I perhaps need 20g to finish the cushion. I'm sure it won't go to waste, it will get used for something but not really in keeping with my stash-busting attempts. It's a lovely quiet day, just me, some documentaries on sky+ and my hooky. I'm trying to coax some fresh air in to blow away the mugginess of the day but there isn't even a sniff of breeze. I am glad I have something else to make other than my blanket or I would be melting with that on my lap. 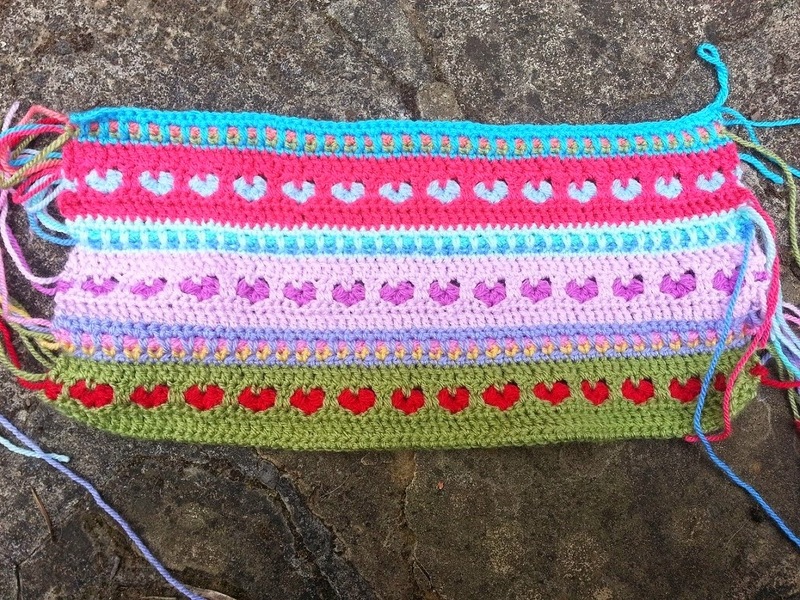 I best get on making notes and trying to work out the next row of this pattern. I'm both nervous and excited about Saturday; oh I do hope it goes well, wish me luck! 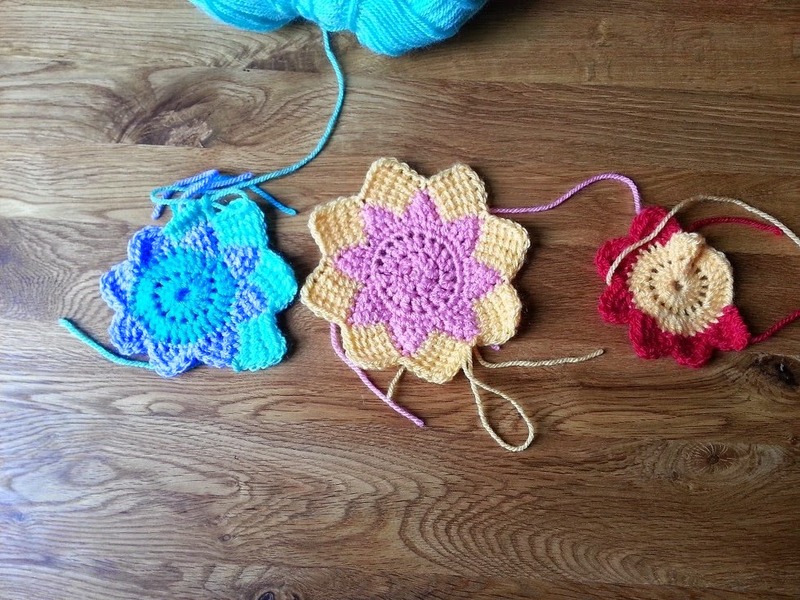 Tunisan crochet in a circle! 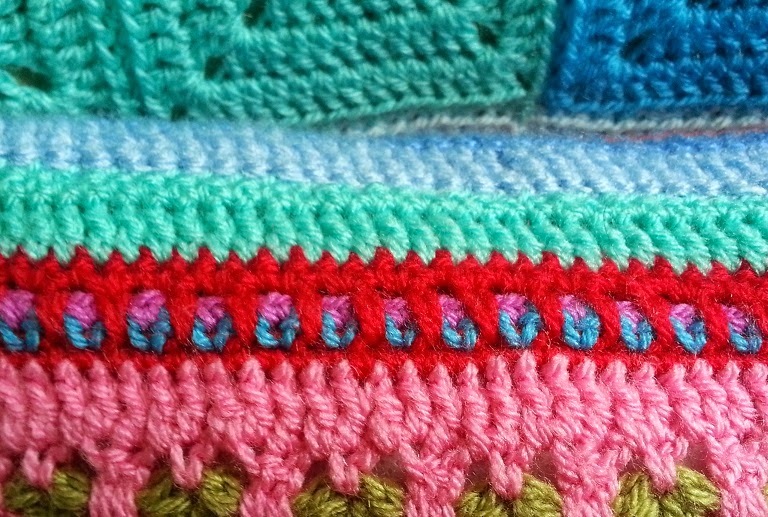 There is a lovely pattern out there called Sunny Daze by Laura Pavy for a big Tunisian Entrelac blanket and it is so beautiful, I have wanted to make something along similar lines for a while. I didn't want to just follow someone else's pattern though, that would be too easy, I wanted to try to do it for myself. 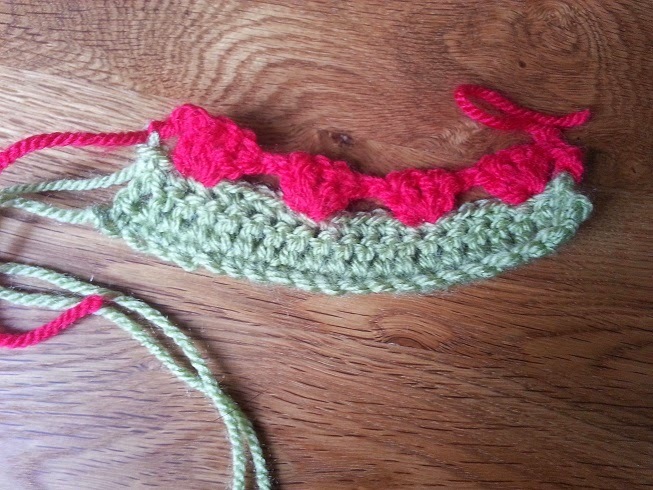 My biggest hurdle was how to start it, so I came up with the idea of crocheting into trebles, (the way I normally would for something round) and it worked! I was just about to get started on the next round when I heard a scraping from behind the TV cabinet. The Demon Cat had brought me a present! A duck! It wasn't a very old duck, it still had most of it's brown downy feathers and only a few proper feathers, but still it was big and I am totally baffled as to how he managed to get it through the cat flap. The duck seemed to be in an OK condition, considering its ordeal, but I had no idea what to do with it. I couldn't leave it there and it seemed in no hurry to move itself so I got a box and put it beside the poor bird and it hopped in. I didn't dare just put it outside, not with The Demon Cat lurking in the garden so I had a walk down to the nearby park and set it free. It hopped out of the box, wings flapping and looking in very good shape, gave me a quack and waddled off into the bushes. 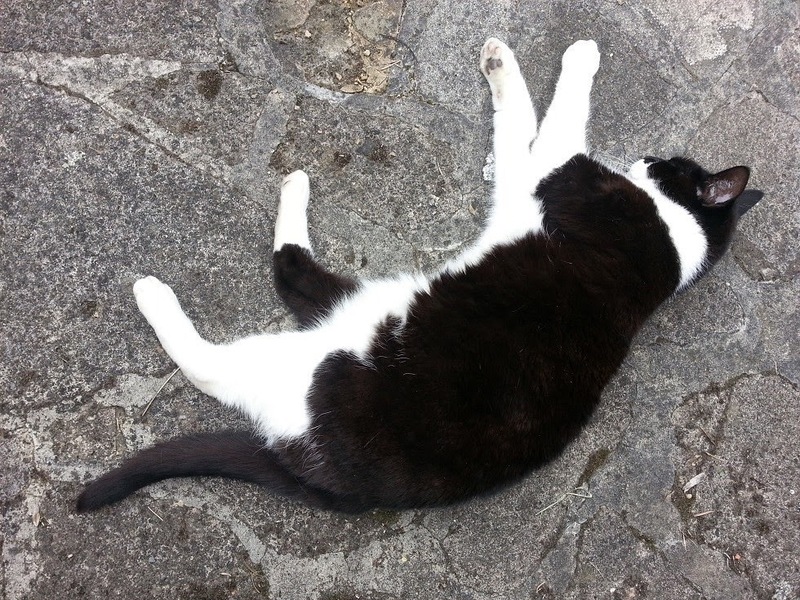 I guess it has more of a chance out there fending for itself than it would have if I had taken it to the Vets, who told me they would have to put it to sleep if I took it to them. Aaanyway, back to my Tunisian circle for a while now the wildlife has been dealt with! Oh it is hot today. I've been doing all the boring Saturday morning things like cleaning and washing and I think it has wiped me out a bit. I'm not the only one who is feeling the heat but I think he might be enjoying it more than I am! I've tried to do a bit of weeding and not got very far, they can wait for another day. 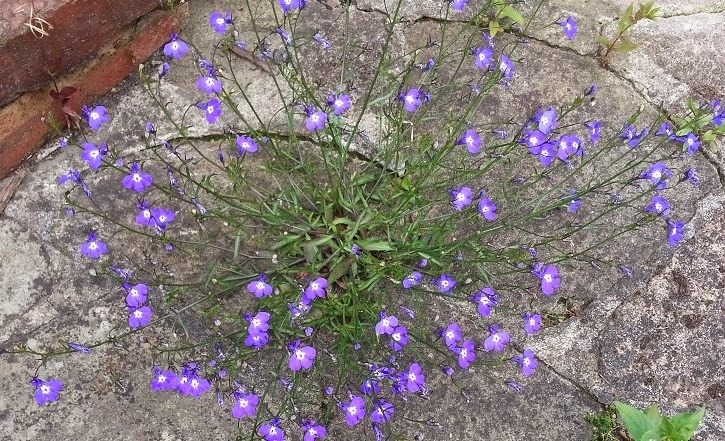 Strictly speaking I suppose this is a weed, it is some lobelia that must have self seeded a couple of years ago when I last had it in some tubs but I haven't the heart to pull it up, it seems to like growing through the crack in the crazy paving. There are a couple of big lavender bushed in the yard too, and I am absolutely thrilled that they seem to be a favourite hang-out of the local bee population! 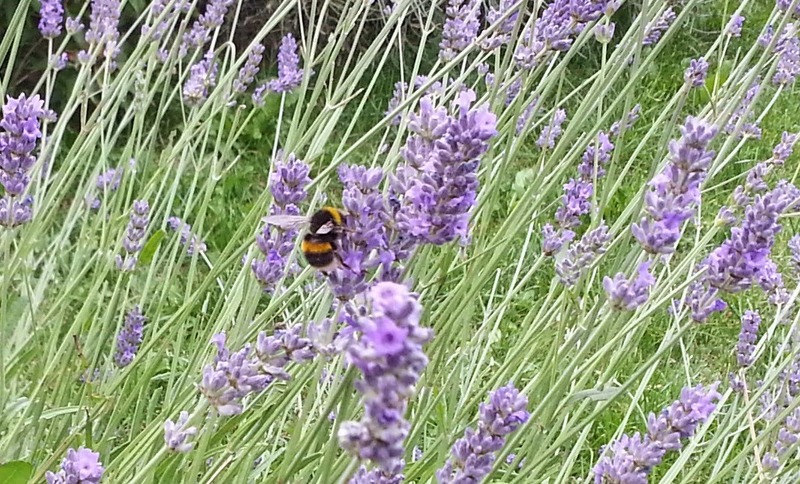 I can sit for ages watching the bees buzzing around the lavender, it smells good too. Thinking about it, I have always loved bees. Now that all the boring housework nonsense is out of the way I am going to spend some quiet time trying to finish off my hearts cushion. It is coming on but I am a bit worried that I am going to run out of yarn. You can see that one side is cream with pink, well I didn't have a lot of cream left so decided to reverse it for the other side and do pink with cream. I still don't think I will have enough. I can buy more of the cream but I have no idea where the pink came from. My dilemma is whether or not to carry on and hope I have enough pink or stop and wait until I have bought more cream, which I expect I will have to do anyway. 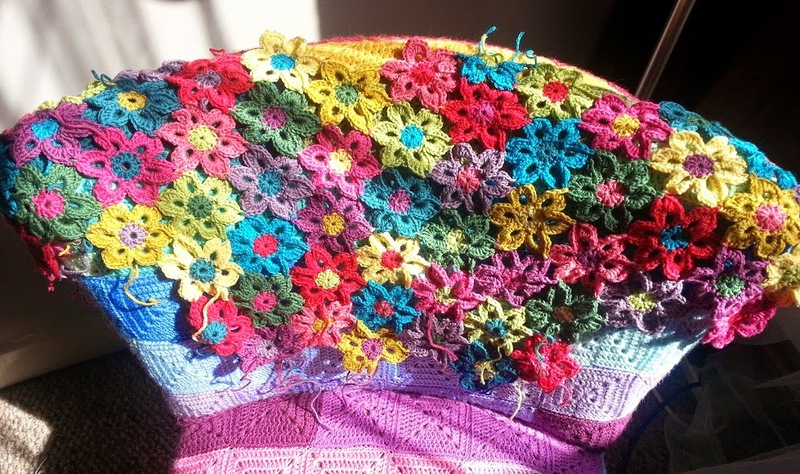 I may just carry on as I do like crocheting this pattern, it is really good fun to do so it wouldn't be the end of the world if I have to unpick it all and start again. 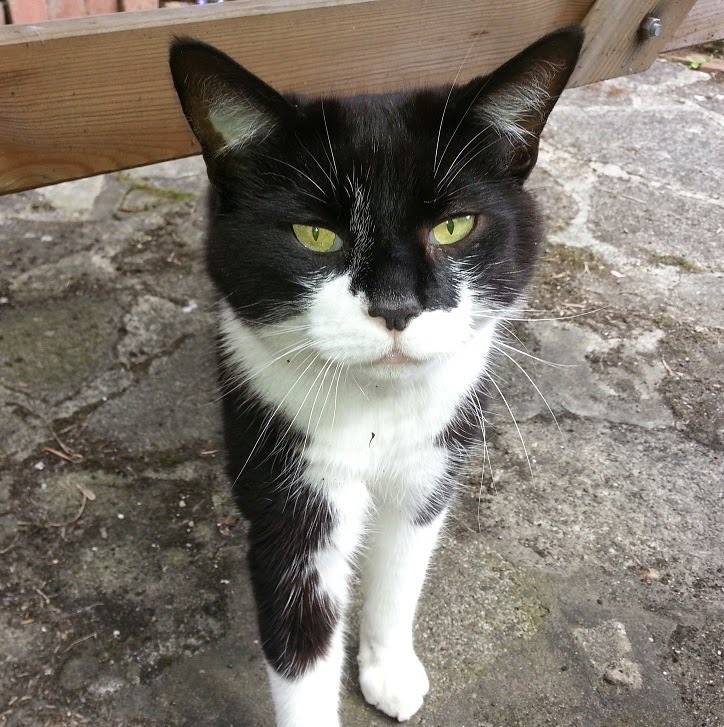 It's a lovely sunny morning so far here in West Yorkshire. 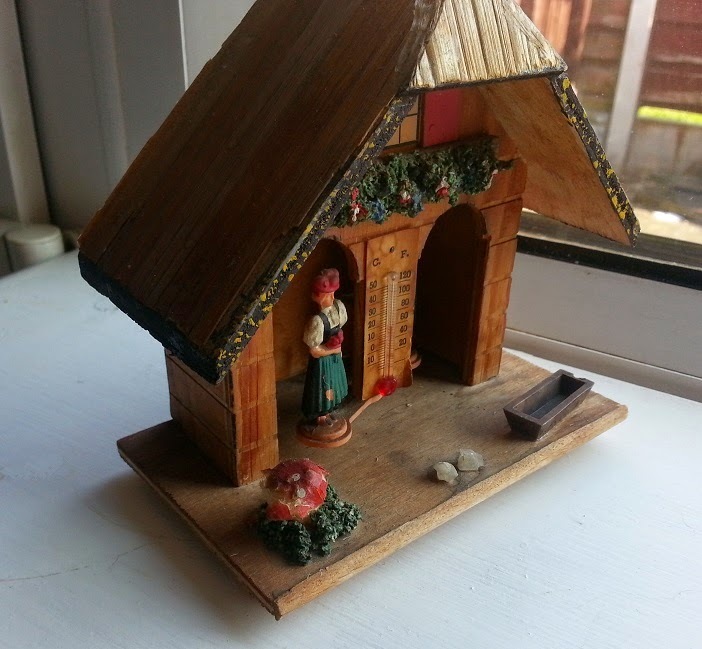 I checked my little weather house to see if it was working - I had suspected that it was broken as I only ever see the man with his brolly, even on warm days - but there she was, the long awaited sunshine lady! As a child I remember checking this weather house every day when I was at my Granny's, always disappointed that the lady never came out - I was either very unlucky to only ever be at Granny's in bad weather or the 80's must have been generally cold and wet! 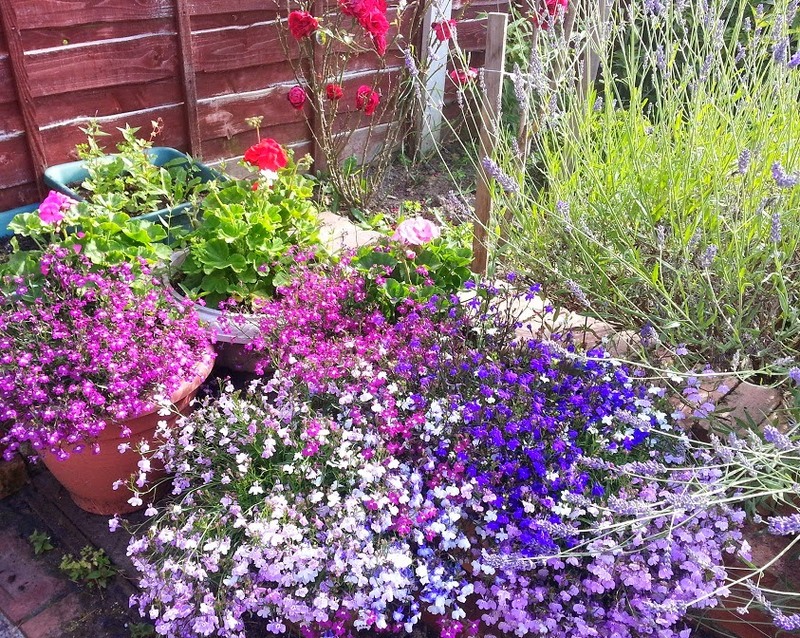 It's looking quite pretty out there if I don't let my eyes stray to all the weeds. I have even managed to grow some geraniums in my tubs which is a first as they usually get eaten by slugs. I decided to have my morning coffee sat outside in the sunshine while I started on my latest crochet project. Yes, more hearts! This time I wanted to see how they would look on their own, it's also much quicker to do them like this. I'm making another cushion cover as it's speedier than a blanket and I really just want to see how they work up into a finished item. I'm using aran weight yarn this time, it's some leftovers that I found in my stash. 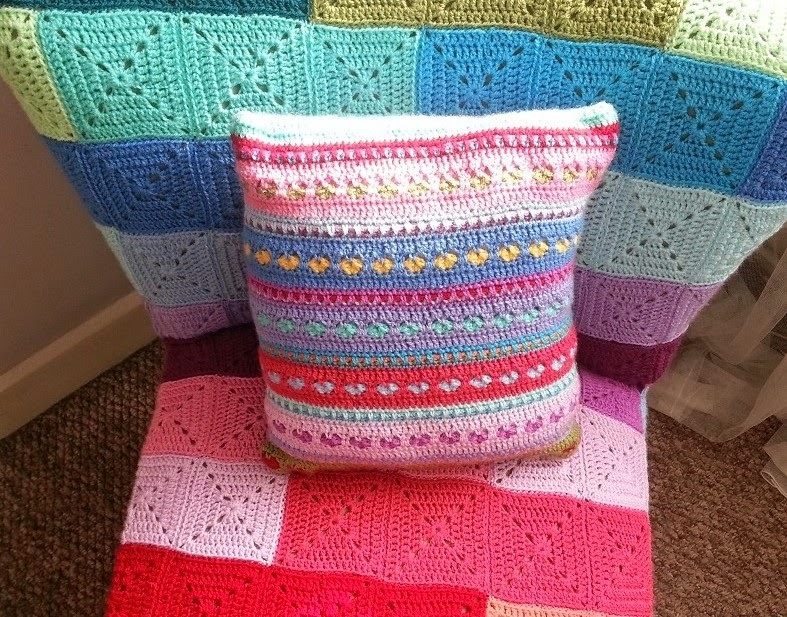 I thought I would have plenty to do one side of the cushion in this same repeat of colours but after just a few rows I am really starting to think that I won't have enough to do the bulk of it in this flecky cream colour. 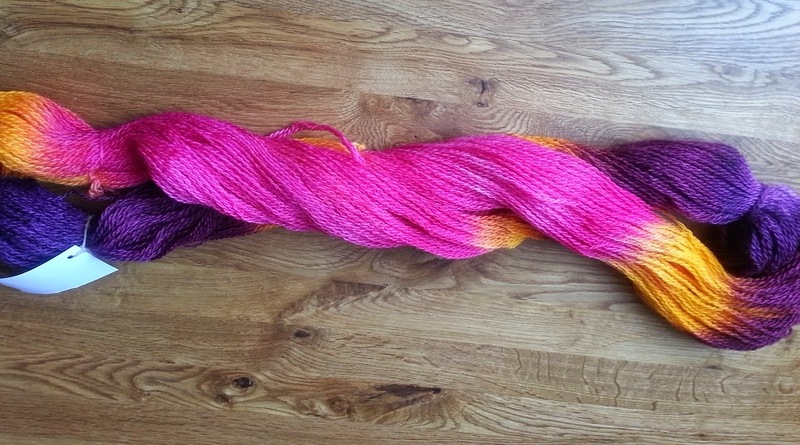 I might have to mix the colour scheme up a bit and maybe stick another yarn in there too so that I have enough. 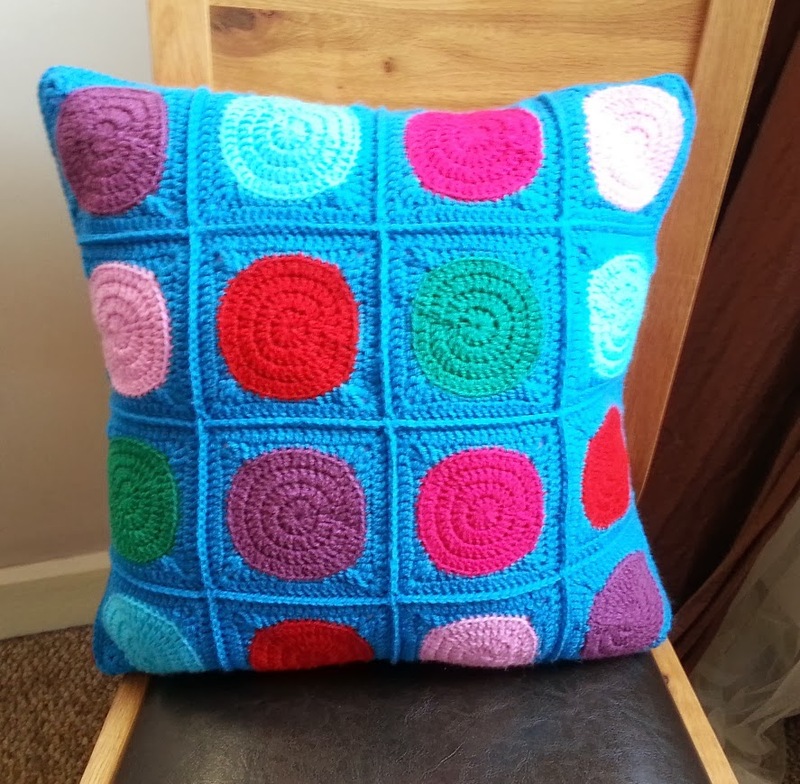 This cushion will also be bigger, it should fit an 18 inch cushion pad when it is done. The last one I made was supposed to fit an 18 inch cushion pad too but it came out a bit small. I didn't have a 16 inch pad to hand so had to butcher a bigger one to make it fit. This means that it is a little bit lumpy in places. That can be fixed though, I just need to buy a smaller one and swap it out. 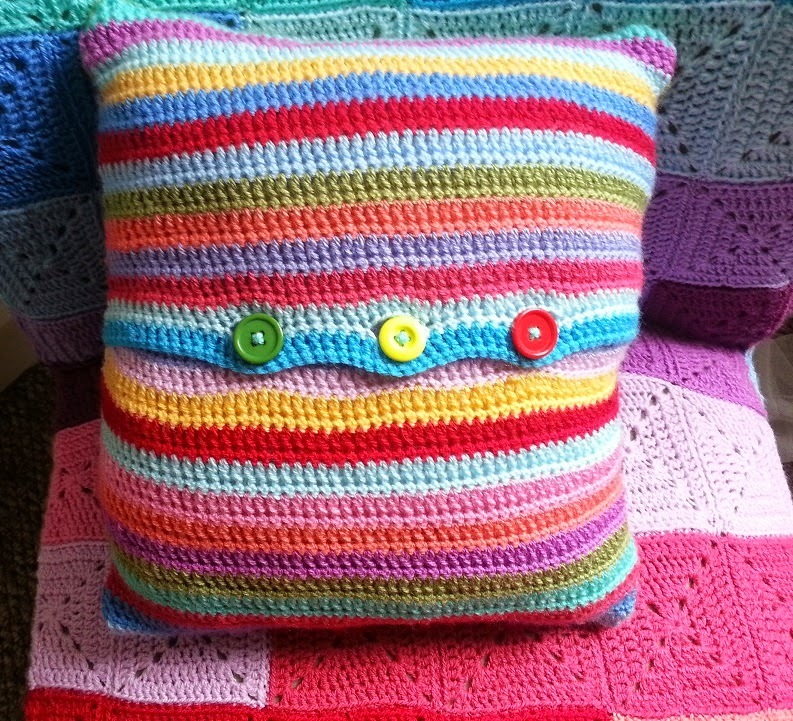 I should have perhaps waited to show you this cushion until I had the proper cushion pad but I get so giddy and excited to show everyone that I just can't help ta-dah-ing as soon as I have put my hook/needle down! I have been trying to come up with a good design for some heart detail in a flat panel, that would work for a blanket or cushion. 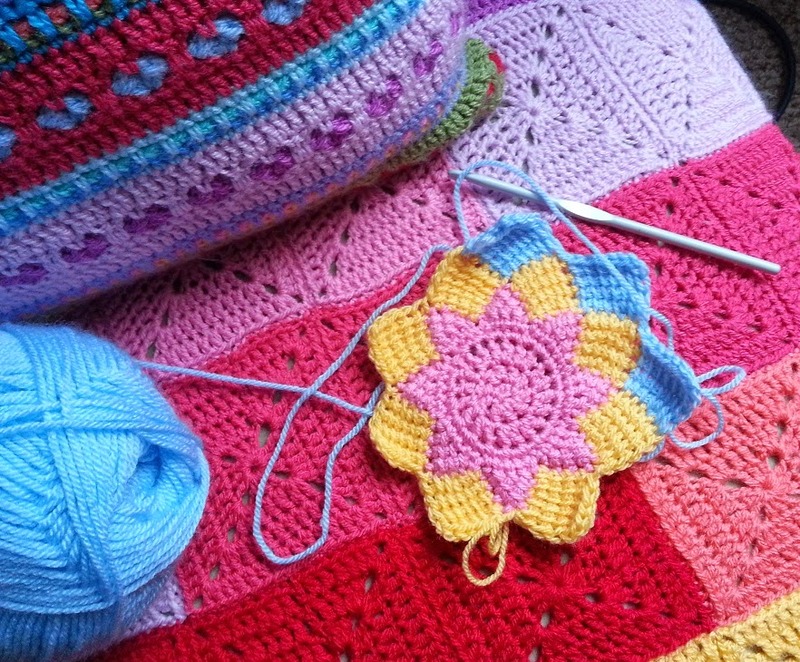 Yesterday evening while I was merrily rippling away on my new blanket I had a moment of inspiration, put down the ripple and hooked myself up a short foundation chain to see if the idea would work. ...This time success! Super chuffed with how that worked out and seemed quite simple to do. In my opinion simplicity is the key to good designs, yes they can have lots of detail but if there is a good repeat, chances are it will look better than having to make adjustments everywhere. 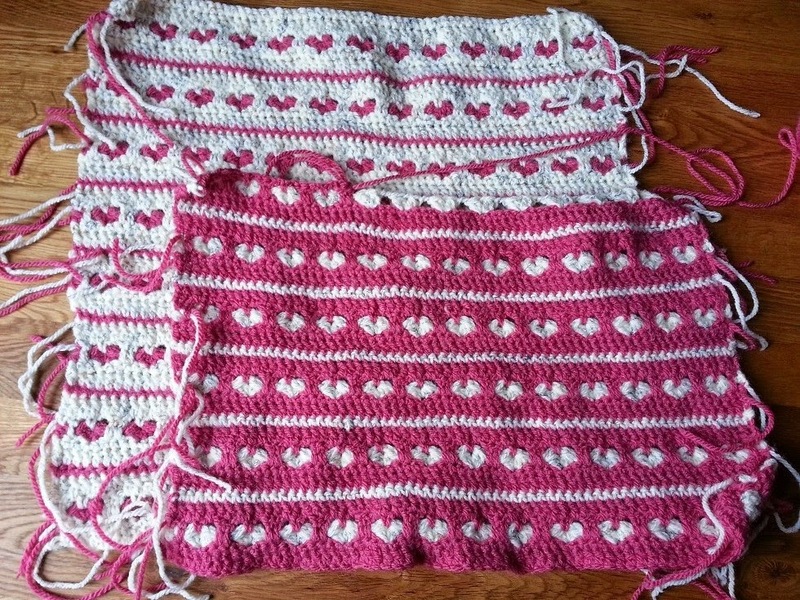 I found a spare 18 inch cushion pad and made a foundation chain big enough for one side and started making rows of little hearts. I think it looks very sweet and if you look closely it sort of looks like a row of tiny flowers. 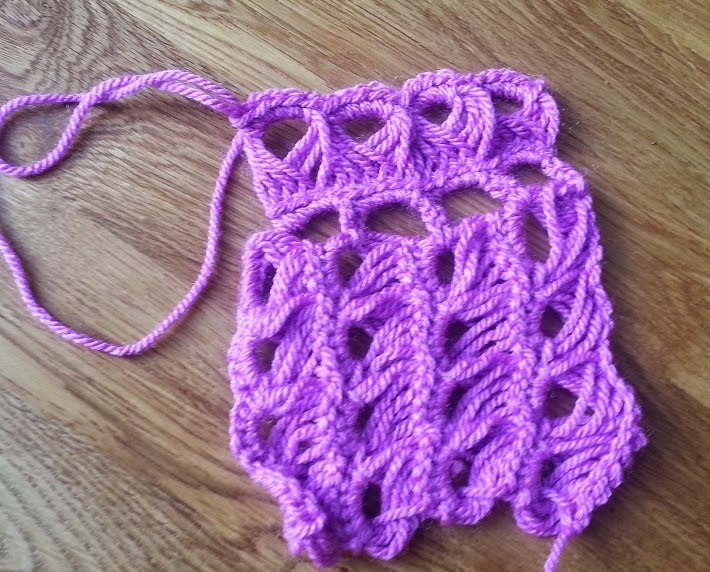 It will need a bit of blocking when it's finished but I think it looks quite effective! 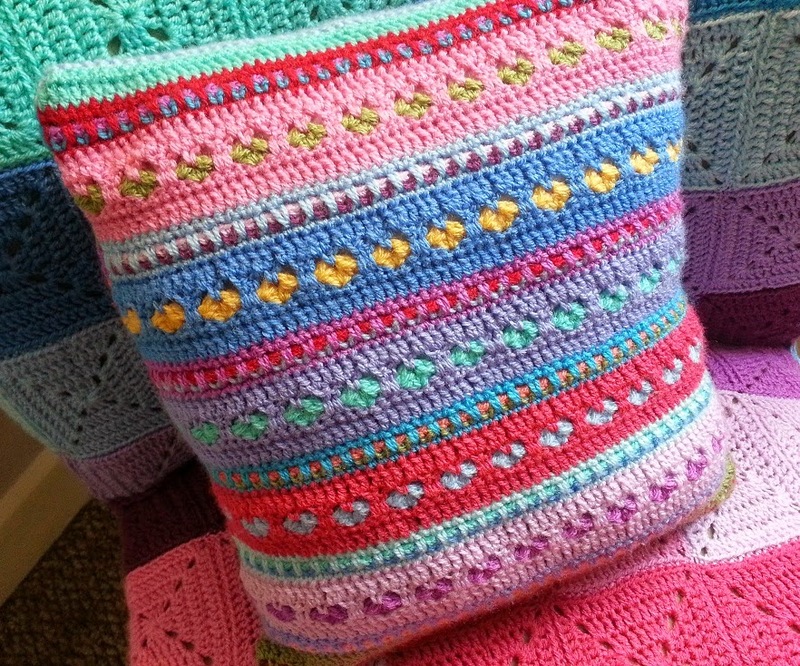 There is a lot of work in this cushion cover, each repeat in the pattern is ten rows - as much of it is made in double crochet which means it grows quite slowly. It is good fun to do though so I don't mind it taking time at all. 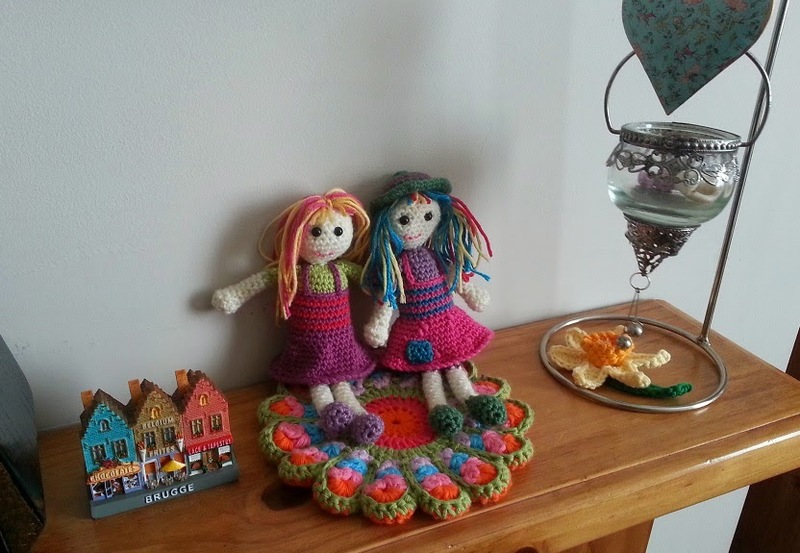 All is good in my colourful little crocheting world. More hearts and flowers and ripples await!